If you believe that you or someone you know may be at risk for suicide, call the National Suicide Prevention Lifeline at 1-800-273-8255 or go to your local emergency room immediately. A person might have persistent thoughts of suicide and never attempt suicide, but a person might also attempt suicide after only briefly experiencing suicidal ideation. Thus, it is important that all threats of suicide and suicidal behavior be taken seriously. Threatens to hurt or kill oneself. Talks or writes about one’s own death. Talks about feeling trapped in an unhappy situation and not seeing any way out. Feels no reason to live or has no purpose in life. Withdraws from friends, school, work, family, and all other important relationships. Engages in risky behavior without caution. 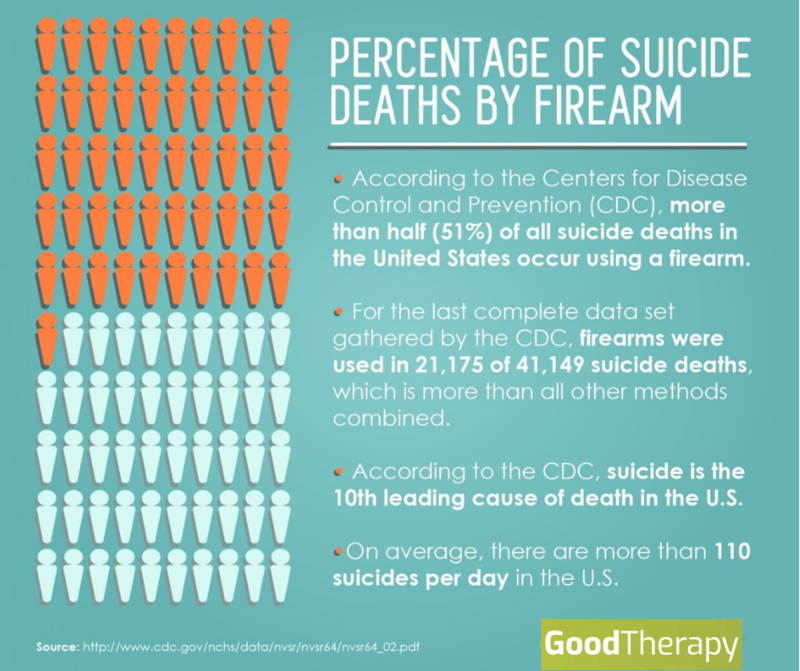 The national average is 11.3 suicides per 100,000 people. Individuals 65 and older have the highest suicide rate: 14.3 suicides per 100,000 people. Suicide is the third leading cause of death for people between the ages of 15 and 24 years. Between 1952 and 1995, the rate of suicide in young adults nearly tripled. An estimated 11 suicide attempts occur for each death by suicide. The American Association of Suicidology (AAS) estimates there are 4.5 million survivors of suicide in the United States. Suicide accounts for 1% of deaths in America. Suicide takes away more total years of life than any other cause of death, other than heart disease and cancer. 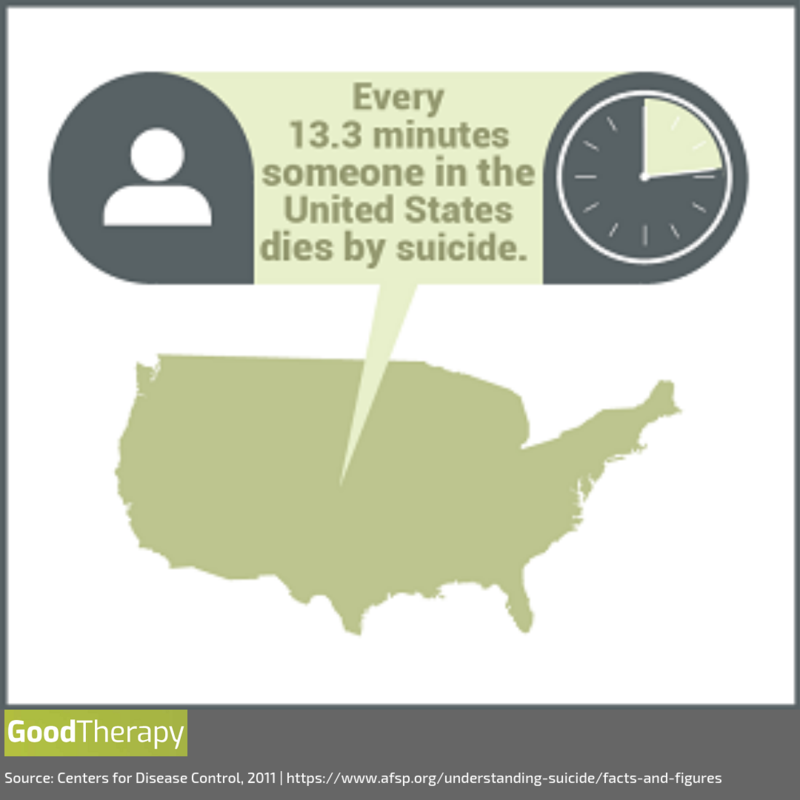 AAS estimates that each suicide intimately affects at least six other people. The suicide rate among men is about four times higher than the suicide rate among women. The most recent data on suicide shows that in 2011, more than 487,700 people were treated in U.S. emergency rooms for self-inflicted injuries. American Indian and Alaska Natives have the highest suicide rates of any ethnic group: 14.3 suicides per 100,000 people. Non-Hispanic black individuals have the lowest suicide rate of any racial group: 5.2 suicides per 100,000 people. A person may have thoughts of suicide for no discernable reason, but often suicidal ideation may occur as a symptom or result of a mental health condition or after one experiences a challenging life event, such as a failed or failing relationship(s); grief; medical illness; rejection; sexual abuse, emotional abuse, or physical abuse; or unemployment. The risk of suicidal thoughts or behavior might also be increased by one’s family or personal history. A family history of parasuicide (self-harm, attempts, or gestures with no intent to die) or a personal history of previous suicide attempts, for example, may increase one’s risk for suicidal ideation. Suicidal ideation and behavior can also occur as a side effect of various psychotropic medications. People diagnosed with schizophrenia have a higher rate of suicidal ideation during periods of remission, and those diagnosed with serious medical illnesses such as AIDS or cancer are more likely to experience suicidal ideation if they also have a psychiatric condition. Suicidal ideation and behavior have been found to be most prevalent in people who are coping with mood issues such as bipolar while also dealing with substance or alcohol abuse. Psychotherapy can often be beneficial for people who are experiencing chronic suicidal ideation and behavior. However, when individuals are at risk of suicide it is essential that they receive a higher level of care, such as hospitalization or intense in-patient or out-patient treatment. Weekly psychotherapy is simply insufficient to protect those who are in crisis and adequately address their risk. Once an individual is no longer in crisis, therapy to treat the underlying causes of suicidal ideation or behavior is typically recommended. The psychotherapy model considers hopelessness to be the strongest contributing factor to suicidal ideation, and a large part of crisis intervention and post crisis counseling aims to restore hope. An individual who continues in therapy once the point of crisis has passed will likely explore ways to resist urges to self-harm (if the person engaged in self-harming behavior), address the factors that led to suicidal thoughts, and create a plan that includes coping strategies and methods to address suicidal thoughts in the event that they recur. When an individual seeks treatment for suicidal ideation, health care professionals will likely attempt to diagnose and treat any medical or psychiatric conditions that may be present. Because a variety of concerns may lead one to experience thoughts of suicide, diagnosing any health concerns, physical or mental, is considered to be an important step in the treatment process. Some individuals may obtain benefit from psychotropic medications, which might be prescribed temporarily along with therapy. In cases of severe suicidal ideation or behavior, or when an individual reaches a point of crisis, hospitalization or intense in-patient or out-patient treatment may be necessary. Because suicidal ideation may lead to deteriorating physical health or self-injury, medical treatment may also be necessary for some individuals. The Diagnostic and Statistical Manual (DSM) lists many psychiatric conditions that may lead to or result from suicidal ideation and behavior. Not all individuals with one or more of these conditions will experience suicidal ideation or behavior, but having one or more of these conditions has been shown to increase one’s risk of suicidal ideation. Adjustment disorder: A psychological response to identifiable stressor(s) that can lead to significant behavioral or emotional symptoms. Anorexia nervosa: An eating disorder characterized by the inability to maintain a healthy body weight and an extreme fear of gaining weight due to a distorted self-image. Bipolar: A mood condition defined by one or more episodes of abnormally elevated energy levels with or without one or more depressive episodes. Body dysmorphia: A psychological condition characterized by excessive concern and preoccupation with a perceived defect in physical features. Borderline personality: A personality condition characterized by a prolonged disturbance of personality function, defined by depth and variability of moods. Dissociative identity disorder: A psychological condition in which multiple and distinct personalities are present. Gender dysphoria: The mental distress that occurs when one’s gender identity does not align with the gender assigned at birth; in other words, gender dysphoria can be described as distress experienced as a result of being in the wrong body. Major depressive disorder: A condition characterized by an all-encompassing low mood with low self-esteem and social isolation. Panic: A form of anxiety characterized by severe and recurring panic attacks. Posttraumatic stress (PTSD): A condition that may develop after exposure to an event that results in psychological trauma. Schizophrenia: A serious mental health condition characterized by disintegrating thought processes and perceptions of reality and diminishing emotional responsiveness. Social anxiety: A form of anxiety in which social situations cause an individual to experience significant fear and distress that may lead to an impaired ability to function. Nonprofit organizations such as American Foundation for Suicide Prevention and Suicide Awareness Voices of Education work to raise awareness and help prevent suicide. These organizations provide educational materials, offer information on support groups and ways to cope with loss, and work to reduce the stigmatization of depression and other mental health issues that may lead to suicidal ideation.